The data for Alphabet are presented in Exhibit 1. The data are not meant to be precise. The goal here is to explore conceptual issues related to growth options and intangible capital. As described by Koller, Goedhart, and Wessels (2016) calculating quantities such as net operating profit after adjusted taxes (NOPLAT) and operating invested capital involves careful attention to a host of small details. Most of those details are not incorporated here so the numbers can be thought of as a first order approximation. For illustrative purposes, it is assumed that aggregate investment spending on all types of intangible assets is equal to twice the spending on R&D. This is meant to be on the high side so as to be sure to incorporate the wide variety of intangible assets that Alphabet has generated internally. The intangible assets are assumed to have a ten-year life and are amortized straight line. The weighted average cost of capital (WACC) can used as benchmark for assessing the numbers in Exhibit 1. Although estimates of the WACC depends on the assumptions made and the model employed, most estimates are in a range around 10.0%, so I will use that number. The are a number of features to note in Exhibit 1. First, the combination of NOPLAT of $21.7 billion and book operating capital of only $79.0 billion results in a return on invested capital (ROIC) of 27.4%, well in excess of the WACC. Second, when investments in intangibles are capitalized the current intangible capital comes to $115.2 billion, bringing total invested operating capital to $194.2 billion. That number is still far short of the market value of operating capital of $717 billion. Third, when both NOPLAT and invested capital are adjusted to take account of intangibles, ROIC(adj) drops to 21.4%. The adjustment for NOPLAT consists of adding back expenditures on intangibles and deducting amortization of intangibles. 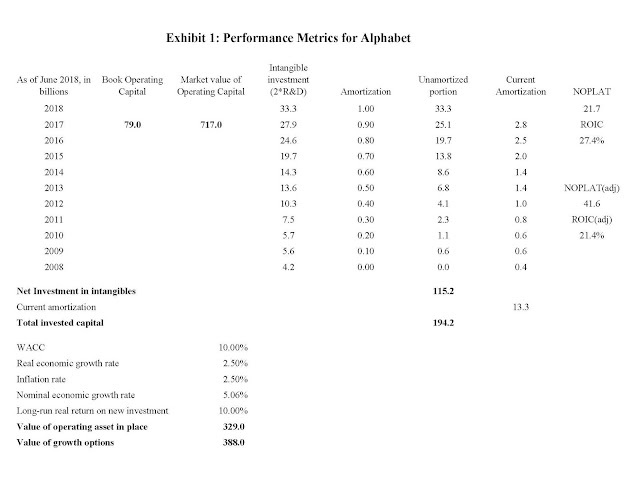 For Alphabet, the impact of adding investment in intangible assets to the denominator outweighs the impact of adding back net investment spending to the numerator. There are two explanations for the immense difference between the book value of invested capital, including intangibles, and the market value. The first is that Alphabet’s investments in both tangible and intangible assets are positive net present value (NPV) projects at the start. If an investment is positive NPV, as soon as the asset is put in place its market value exceeds the invested capital. This begs the question of where the positive NPV projects come from. In a competitive market, they would not exist. The answer must be that they are attributable primarily to the pre-existing intangible capital – something that competing companies cannot replicate. It is by combining the new investments with the pre-existing intangibles that positive NPV projects are created. Some may say: what if the company simply scours the markets more carefully and, thereby, finds positive NPV projects? But the ability to do such scouring is a form of intangible capital. So once again existing intangibles are the source of the value creation. Second, over time the market is continually reassessing the value of operating capital assets, including intangibles, based on the cash flows they are expected to produce. Such reassessments can widen the gap between the amount invested in intangibles and their market values. Turning to growth options, as defined originally by Myers (1977) growth opportunities, or growth options, are “best regarded as the present value of the firm’s options to make future investments. The distinction being drawn here is between assets whose ultimate value depends on further, discretionary investment by the firm, and assets whose ultimate value does not depend on such investment.” Myers then divides the total value of the firm into two parts: the value of the assets in place and the value of the growth options. He does not attempt to describe how either is to be calculated for an actual company like Alphabet. Before addressing the valuation of growth options, there is a preliminary question regarding the relation of intangible assets to growth options. Consider two firms, one of which has valuable growth options and the other of which does not, they must currently differ in some way that accounts for the existence of the growth options. That difference presumably is some type of intangible capital. Admittedly it may be difficult to identify exactly which intangible assets produce the growth options for one company and not the other. For instance, the growth options might be related to more nebulous intangibles such as the organizational structure of the company or the skills of the employees, but whatever the precise source, the growth options must be related to some intangible assets that one firm possesses but the other does not. This implies that if intangible capital is defined with sufficient generality, there are no added growth options. The market value of the firm equals the market value of the operating assets broadly defined. The reason for stressing what may seem like a pedantic distinction is to avoid double counting. If full account is taken of all intangible assets, then there is no need to add growth options. Put another way, the value of the firm can be thought of as equaling the value of assets in place plus the value of the growth options or the value of tangible plus intangible assets, but the two should not be mixed. The foregoing does not imply that a division of operating market value into the value of growth options and the value of the assets in place is meritless, it simply implies that it depends entirely on the definition of “assets in place.” If assets in place are defined broadly so as to include all intangibles of any type, then the value of the growth options is zero. But that is not a way that assets in place are typically defined. A more common definition is to say that the value of the assets in place equals the operating value of the firm assuming that from the current date forward it grows only at the rate of the aggregate economy. In terms of valuation modeling, this is equivalent to assuming that the current NOPLAT represents the “terminal year” and to assume steady state growth thereafter. In Exhibit 1, I assumed steady state growth of 5.06% based on both inflation and real growth equaling 2.5%. I also assume that the real return on new investments in the steady state is 10.0%. Given these assumptions, the terminal value (which by assumption equals the value of the assets in place) can be computed using the plowback formulas described by Bradley and Jarrell (2008) and Cornell and Gerger (2017). The result, as shown in Exhibit 1, is that the value of the assets in place comes to $329 billion, leaving $388 billion as the value for growth options. Notice that the value of the assets in place exceeds the invested capital, including intangibles, of $194 billion. This makes sense because the intangibles not only produce the growth options but also enhance the current earning power of the invested capital as reflected in the fact that the ROIC exceeds the WACC. It is possible, of course, to define the assets in place differently. For example, the consulting firm Charles River Associates uses five years of analyst projections to forecast NOPLAT for next five years and assumes steady state growth thereafter. 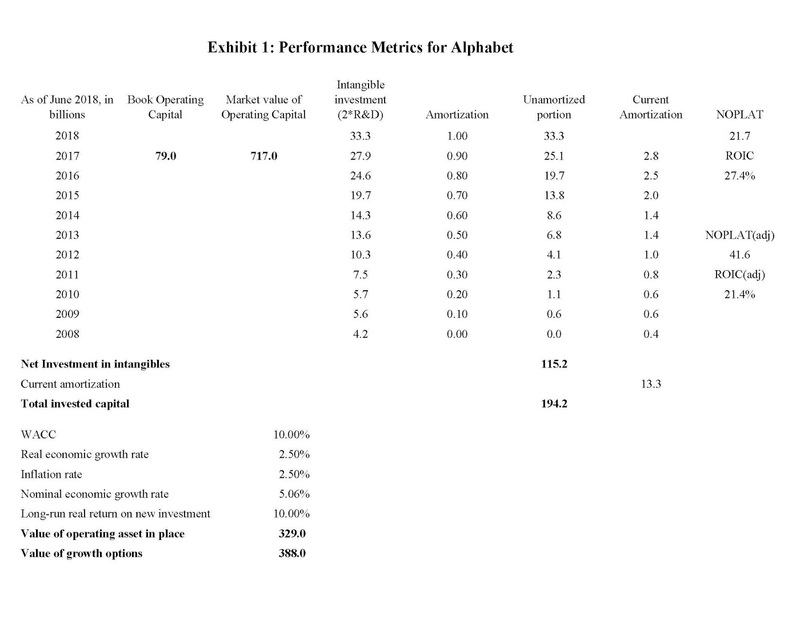 For Alphabet, applying that procedure increases the estimated value of the assets in place and correspondingly reduces the value of the growth options. This underscores the key point that growth options are a residual whose value depends on the procedure used to calculate the value of assets in place. For those of you who would like a PDF copy of the paper, including the references, please visit www.cornell-capital.com. Operating capital is defined net of cash and short-term investments.